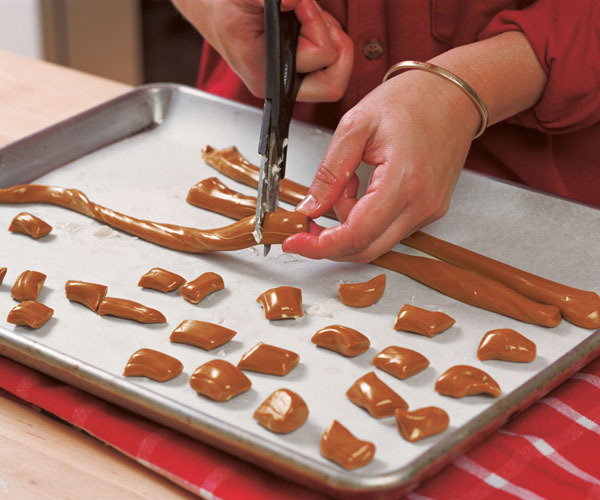 Make this mouthwatering candy with a friend to help with the pulling. You’ll need a large uncluttered area for cooling and pulling the taffy. Don’t be tempted to use a smaller saucepan as the mixture greatly increases in volume after the baking soda is added. Butter a large marble slab or a jellyroll pan. If using a pan, set it on potholders or towels to protect your counter from heat. Have a parchment-lined baking sheet handy. Coat a heavy 3-qt. saucepan with a light film of butter. Combine the cane syrup and vinegar in the pot. Bring to a boil over high heat, stirring, and then reduce heat to a simmer and insert a warmed candy thermometer. Make sure the ball of the thermometer is immersed in the liquid so that the temperature will register correctly. Continue to cook, stirring, until the liquid just reaches 275°F. Remove the pan from the heat. Add the butter, salt, and baking soda. The mixture will foam rapidly to four times its original volume and become a much lighter butterscotch color. Continue to stir (the foam will subside and the color will deepen) until the foaming stops, about 3 minutes. Remove the thermometer and pour the mixture out onto the buttered marble slab or jellyroll pan. Let cool slightly. Grease a large metal spatula and have a large pat of butter (at least a few tablespoons) ready to grease your hands. When the candy is just cool enough to touch at the edges, use the spatula to lift the edges of the candy, draw them to the center, and let them drop. Continue folding the candy in on itself until it’s cool enough to pick up. Pick up the candy (divided into two or more sections if you have people to help you pull) and begin pulling, twisting, and folding. Twist the candy as you pull it, and pull in short lengths (a foot or so) for better control. If the candy does get stringy, just mash and push the strings together with your thumbs and palms and it will form one strand again. Grease your hands as necessary, continuing to pull and twist as the candy begins to lighten in color and becomes more difficult to pull. Keep pulling until the candy is very tough to pull and seems almost plastic. It will have turned a silky dark ash-blond color. Pull the candy into a thin rope (3/4 inch in diameter) and begin snipping off bite-size pieces (about 3/4 inch long) with greased scissors. 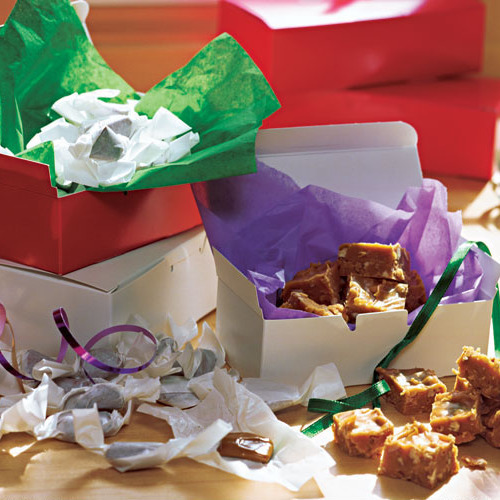 Wrap in pieces of waxed paper or parchment and store at room temperature (not in the refrigerator, which will make it sticky). If left unwrapped, the candy may spread (as if it were melting).